Billy has choreographed and worked as a body double on TV commercials with stars such as Lionel Messi, Christiano Ronaldo, Ronaldinho, Zlatan Ibrahimovic, Fernando Torres & Alessando Del Piero. He provides the director and crew on what movements are realistic and achievable, whilst explaining the director's needs in a 'football language' to get the most from the athlete, and put him at ease while he works out of his comfort zone. He also provides skills demonstrations and advice to enhance the players presence in the commercial. Billy has also choreographed and worked as a football consultant on photo shoots for global campaigns for brands such as Nike and Pro Evolution Soccer (Winning Eleven). Having been photographed and worked on so many shoots himself, Billy knows what is required from the athlete down to the finest detail and demonstrates the photographer's needs directly to the athlete, avoiding any 'lost in translation' issues. He also gives valuable experience to the photographer on what angles and movements work best for each particular player. 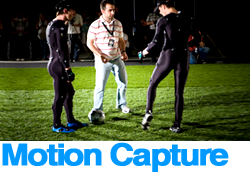 Billy has a vast experience in providing the football movements for motion capture shoots for video games, films and TV commercials. 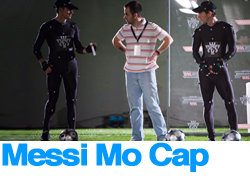 He has choreographed stars such as Lionel Messi into what the developers need from each movement and has also directed motion capture shoots involving football. Billy's movements have been used by Pro Evolution Soccer (Winning Eleven) in the intro and video game itself, but were most famous for Puma's 'Until Then' global campaign commercial.See here. 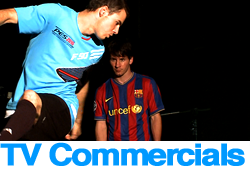 Billy recently choreographed the skills and movements for FC Barcelona star Lionel Messi, in a motion capture shoot for the forthcoming PES 2011. 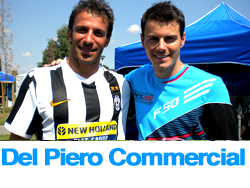 Billy choreographed the movements for World Cup winning Juventus legend, Alessandro Del Piero, for the European TV commercial campaign of Pro Evolution Soccer 2010. Billy choreographed his good friend Fernando Torres on the photo and TV commercial shoots for the worldwide campaign and pack shot of Pro Evolution Soccer 2010.